Several of the world's most famous dinosaurs are featured attractions of Digital Morphology. On the following pages you can see the two oldest known dinosaurs, Herrerasaurus and Eoraptor, along with their younger relatives, Syntarsus and Allosaurus. These rare and priceless specimens were brought to UTCT to be scanned, so that their skulls could be examined from the inside out. Did dinosaurs have tiny brains? What was the brain of the oldest dinosaur like? Was anything going on inside its head? Until CT technology was available, these questions could only be answered using techniques that break and damage fossils. CT scanning provided the answers non-destructively, and you can see some of the results on the following pages. Coming soon: exciting new dinosaur discoveries from Mongolia. Who were the oldest dinosaurs? Hererrasaurus and Eoraptor are the oldest dinosaurs ever discovered. Both were small! Although the name ‘dinosaur’ commonly evokes images of huge ponderous creatures, the earliest dinosaurs were within the size range of humans. These early dinosaurs walked on their hindlimbs alone - they were bipedal, like we are. But from small bipedal forms resembling Hererrasaurus and Eoraptor evolved giants like Allosaurus, Tyrannosaurus, and Brachiosaurus. In some cases the giants reverted to walking on all fours, in order to support their hulking bodies. But in every case, the giant quadrupeds had ancestors that were small and bipedal and looked very much like Hererrasaurus and Eoraptor. Herrerasaurus is the oldest and one of the most primitive dinosaurs ever discovered. Herrerasaurus was probably not the actual ancestor of all other dinosaurian species, but it is the closest candidate yet discovered to an ancestor, so it gives us a glimpse of what the ancestral dinosaur may have looked like. This makes Herrerasaurus one of the most exciting dinosaurs yet discovered. Among researchers, there is controversy over how Herrerasaurus is related to other dinosaurs. By running this skull through UT’s high-resolution X-ray CT scanner, they can now study internal structures such as its braincase and reconstruct what its brain looked like. With this new information, researchers may now have the evidence they need to solve the problem of where Herrerasaurus fits on the family tree of dinosaurs. From the shape of the cavity that once held its brain, they are also forming a picture of its intelligence and behavior. See a full description of the Herrerasaurus scan project. Eoraptor is only slightly younger than Herrerasaurus, yet it already shows specialized features indicating that it lies several branches up from the base of the dinosaurian family tree. It is one of the most primitive members of the great lineage Theropoda - the theropod dinosaurs - which includes such celebrities as Tyrannosaurus rex, Allosaurus, Deinonychus, and Velociraptor. Some of these became huge, although most remained small, like Eoraptor and Herrerasaurus. And it is among these small theropod dinosaurs that we can now trace the ancestry of living birds. See a full description of the Eoraptor scan project. How old are the oldest dinosaurs? Herrerasaurus and Eoraptor both date back some 232 million years, to the middle of the Triassic. Herrerasaurus is the older of the two, but Eoraptor is younger by only a split geological second. By comparison, fossils of our own species date back only about 400,000 years, so these oldest dinosaurs are more than a thousand times older than the oldest human fossils. While this may seem almost unbelievably ancient by human standards, from a geological perspective dinosaurs are comparatively young. Current evidence indicates that the Earth is about 4.7 billion years old, and that Life itself originated more than 4 billion years ago. Dinosaurs thus originated after more than 90% of Life's history had already passed. Where were Herrerasaurus and Eoraptor discovered? Both of these precious specimens were collected from middle Triassic rocks in the Ischigualasto Basin of Argentina. Very slightly younger (late Triassic) dinosaurs have been found in Texas, Arizona, and New Mexico. The Ischigualasto region, set aside as a natural preserve, is an area rich in natural beauty and fossils. Dr. Oscar Alcober of the Museo de Ciencias Naturales, San Juan, Argentina brought Herrerasaurus and Eoraptor to UTCT for scanning. 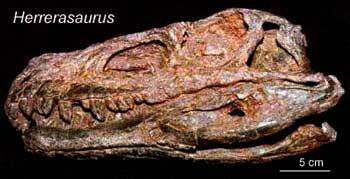 Also on this site is the skull of Syntarsus, a small predatory dinosaur from Arizona that was about 180 million years old, and its larger, younger and more famous relative, Allosaurus. The Syntarsus specimen, although broken and crushed as it was buried, is the most complete skull known. The Allosaurus specimen is an isolated braincase. Although not a dinosaur, Rhamphorhynchus, one of the flying reptiles known as pterosaurs, is also featured on this site. The brains of pterosaurs filled the braincase, as can be seen in this scan. Like most other flying creatures, Rhamphorhynchus possessed a great sense of vision and its enlarged cortex served as a powerful computer to integrate sensor information and direct its muscles in flight.